Why Is The Stock Market So Volatile? You and I are told time and time again that the stock market is volatile. It’s a given. But why is the market so topsy turvy? Nobody explains that. How can a stock that was worth $30 a share only a few days (or hours) ago suddenly be worth $15 or $50 per share now? That’s just crazy. While few people explain why the market is so volatile it’s an important topic. If you don’t understand what’s behind these gyrations the market roller coaster could shake you right out of your investments faster than you can say,”Geronimo”. And if you buy or sell based on your emotional reaction to those ups and downs, it can spell investment disaster. Let’s make sure that doesn’t happen to you by putting stock market volatility under the microscope and seeing what makes it tick. In order to understand why the market shakes, rattles and rolls, you have to view it within the context of time. I’ve created two charts for you. 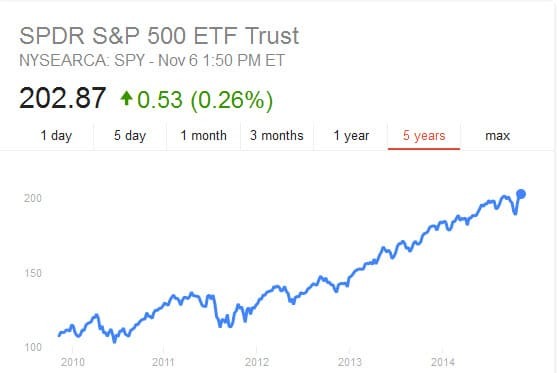 The first one shows what happened to SPY (an ETF which seeks to replicate the returns of the S&P 500 index) from 2009 through 2014. As you can see, it looks pretty good. Sure there is some volatility but this ETF more than doubled between 2010 and 2014. I’m sure you could live with that kind of volatility. It doesn’t look that bad. Right? This shows a different face of market volatility – and it’s ugly. 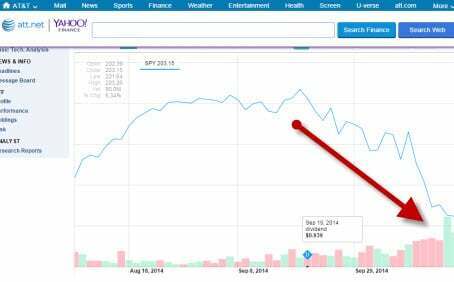 Over a span of 3 short weeks in September of 2014 that same ETF lost over 7%. If you place yourself in this situation it’s difficult to have a long view and relax. And it’s very challenging to have the perspective the first chart provides when you are in the middle of something like what you see in the second chart. The market looks a lot more volatile over this shorter time-frame and it can be pretty frightening. Neither of the graphs indicate what the market is going to do in the future. They simply illustrate market volatility within the context of time. Sobering. What Moves Stock Prices In General? The same is true on the downside as well unfortunately. When the market drops, most stocks drop along with it. There are of course significant exceptions to this. But for the most part, stocks rise and fall with the tide both in the short and long term. What Causes Short Term Volatility? Perceptions and emotions move individual stock prices and the overall market in the near term. If investors feel that good times are ahead for the economy and/or an individual company, the prices of those securities will probably go up until that perception changes. Investors’ perceptions and emotions are heavily influenced by news events. So when the government reports one day that unemployment is dropping, the market could do quite well that day. But if another report is released the very next day bemoaning the price of energy or an increase in inflation, the market might get spooked and decline. Just as there are quite a few news stories that are released throughout the day there many different forces at work which move the market and stock prices at any given time. Nobody knows exactly which news item moves the market in any particular day but investors definitely fall victim to the herd mentality. Once a few big players react strongly to a story, everyone piles on. So if something happens that makes people think or feel differently about the market as a whole or an individual company, the prices in question can really move over the short run. Over the long-run, feelings, thoughts and guesses have almost nothing to do with the market. It’s all about real profits and interest rates. Let’s first speak about profits. When you own shares you really own a small percentage of a business. As the business becomes more profitable, the value rises. It’s very simple and straight forward. What people think about the future of a company will impact its stock price over the short run. But the actual profits of the company will determine the stock price over the long-run. Having said that, it’s important to understand that stocks are just one investment alternative. Bonds are the biggest competitors for investors’ dollars. That’s one reason why interest rates impact stock prices. If rates rise investors might decide to sell their stocks and buy bonds. If rates drop, investors sell bonds and buy stocks. As more people crowd into the stock market there is more competition for stocks and prices go up. So, over a prolonged period of low interest rates, stocks could become pricier and pricier. Clearly, the reverse of this is also true. If rates rise over a long period of time stock prices could decline all other things being equal. Stock market volatility can be discomforting. But look at this from both a short and long term view. My suggestion is to think about using equity growth to help meet long-term financial goals and try hard not to get caught up in the short-term emotional roller-coaster ride. My experience tells me if you understand what makes the market so volatile you will be better equipped to find the right investment strategy to help you overcome the strong emotions when things get whacky. Does market volatility make sense to you? Does it impact your investment decisions? How?